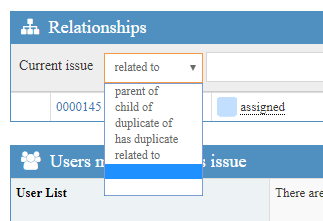 I set up a custom issue relationship following this guide, but where I would expect it to show up, the line is blank. Back when I was running mantis 2.12.0, nothing showed up there at all, then when upgrading to Mantis 2.17.0, it had me move the custom_*_inc files to the config folder, and this showed up. If anyone has any ideas about what I could try to get this working, I'd like to hear them. Thanks! Are you sure that you have the right custom_strings_inc.php in config folder? Deleting and re-uploading the file fixed the issue. Thanks!